Let's listen to real life English. This is a very common question among those who learn English or practice spoken English. However, in our opinion, it is not a very important question as you will learn to pronounce it natural while practicing spoken English. As a non-native English speaker, even if you do not pronounce it one hundred percent accurately, it will not be a big problem as long as you are a fluent speaker. On the other hand, if you practice LearnEnglish18 continuously, you will learn it naturally without any extra effort. Having said that, if you are really interested to learn it, it is not a waste at all. We pronounce some letters with voice and some without voice. Voice is the sound that you generate from your vocal codes. The "t" sound is produced without vocal codes and hence it's called an unvoiced sound. 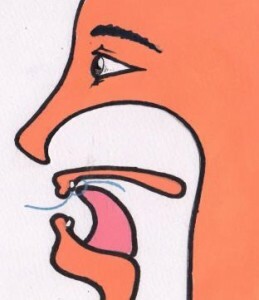 In order to produce this sound, the tip of the tongue should be slightly pressed against the tooth ridge and at the same time the sides of the tongue should touch the inner sides of the upper teeth. With this tongue position, air is slightly pressurized before the tongue and then released with a downwards movement of the tip of the tongue. But no voice is produced. This is just a general description but there are some variations as well. For example, consider the word "water" and "computer", in american English. They are pronounced as "waDer" and "compuDer" respectively, where and "t" = "d". Another example in american English is "interview", it is pronounced as "inerview", where "t" is completely silent. But as we mentioned, you should not try to imitate any of these, just learn spoken English with LearnEnglish18 and allow the pronunciation and accent to develop by themselves without worrying much. If you are interested to learn more, please visit oxfordlearnersdictionaries.com. Start Learning English Today from Semester 1. But remember, practicing daily is essential! Learn Spoken English with MOVIES!!! It's like playing a game. It teaches you real life English without even touching a pen. Most of all it's FREE! Not only for Sri Lanka, but also for everyone else. Visit Semester 1 now and start practicing today! ඉහත දැක්වෙන්නේ The Matrix චිත්‍රපටිය ඇසුරෙන් සකස් කර ඇති Semester 2 හි උදාහරණයක්! ඒ කතා කරන දේවල් හොඳින් තේරෙනවා නම් ඒවගේම වෙනසක් නැතිව ඒ අයත් එක්ක දක්ෂ ලෙස කතාව පවත්වාගෙන යන්න පුලුවන්නම්, වෙන මෙකක්ද? Visit us now and see for yourself, it's FREE and its FUN to learn Spoken English. ඔබ පාසල් අවදියෙන් පසුව ඉංග්‍රීසි පංති කිහිපයකටම ගොස් ඇති බවට සැකයක් නැහැ. 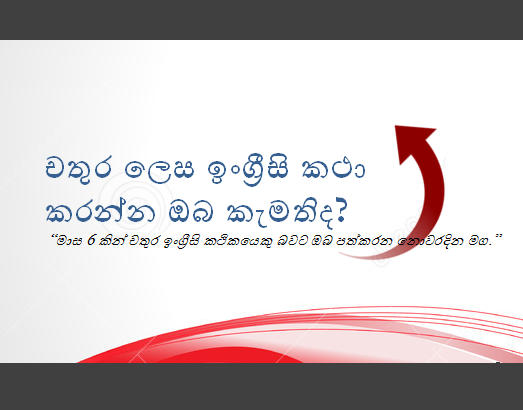 නමුත් ඒවායින් ප්‍රයෝජනයක් වුනාද?